Spousal Support Tax Change in 2018 — Finish Your Divorce Now! In the final days of 2017, the United States Congress passed the Tax Cuts and Jobs Act, making many big changes in the way taxes will work in years to come. If you are considering a divorce and are planning on paying spousal support, the changes to spousal support tax laws could affect you. Whether you are allowed to deduct alimony payments could depend on whether you finish your divorce in 2018. 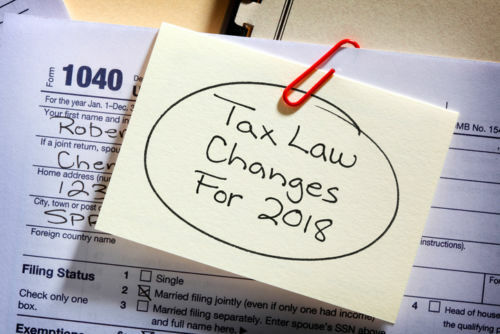 In this blog post, I will discuss how the 2018 tax reform laws will affect your divorce settlement. I will explain the changes to the way spousal support or alimony are taxed and why you may want to finish your divorce in 2018. Married couples filing jointly will be allowed to deduct $24,000 for 2018, compared to $13,000 in previous years. Single taxpayers or those filing separately, have access to a standard deduction of $12,000 instead of $6,500. Heads of households will be able to deduct $18,000 instead of $9,550. The tax reform bill also adjusted the tax brackets, which direct the percentage of adjusted gross income taxpayers must pay in taxes. This adjustment decreases the top tax bracket, which applies to individuals making over $500,000 or families making over $600,000 from 39.6% to 37%. The adjustments also mean that many middle class families could be charged a lower percentage than they were previously. To offset the loss of tax revenue, the Tax Cuts and Jobs Act drastically limits the itemized deductions available to tax payers. From the family law perspective, one of the biggest changes is that starting in 2019, people paying spousal support won't be allowed to deduct those payments from their taxes. Up until now, alimony (often called spousal maintenance) was an allowable deductions on a person's federal tax return. That meant that the person paying spousal support could reduce their adjusted gross income by the amount paid to their former spouse, and that spouse in turn would have to report the alimony as income. Under the Tax Cuts and Jobs Act, that deduction will go away. That means for any Judgment of Divorce entered after December 31, 2018, the person paying spousal maintenance will still be taxed on the money he or she made and then paid to the other spouse. The same rules will apply to any spousal support orders modified after the end of 2018, and to earlier orders if the parties expressly choose to apply the new law. "Alimony" can be one of the hot button issues for any divorce negotiation. Many people feel it is "not fair" that they are required to pay for their former spouses' living expenses after the marriage ends. However, in long-term marriages, especially when there is one primary wage earner who has paid the household bills, paying spousal support, at least over a short-term period can be appropriate and equitable. In past years, one point in favor of paying spousal support has been that the payer may receive tax benefits from doing so. Because the person paying spousal support is often in a higher tax bracket than the person receiving it, he or she often receives a significant benefit by being able to reduce their adjustable gross income by the value of the alimony paid. If the deduction pushes the payer into a lower bracket, that lower tax level would apply to all of his or her income. That silver lining has been removed under the new tax law, and makes paying spousal support a harder blow to higher-paying spouses looking to resolve their divorce without the need for trial. What Are Your Options if You Will be Paying Spousal Support? If you are considering or in the process of divorce, you may have some options to avoid being taxed on spousal support under the Tax Cuts and Jobs Act. Most obviously, you and your spouse can resolve your dispute and get your Judgment of Divorce entered before December 31, 2018. The changes to the tax law will not apply to any orders finalized by that date, even if the spousal support is paid in 2019, or further into the future. Some courts may also allow you to resolve the alimony portion of your dispute and enter a spousal support order before the 2018 deadline while you continue to negotiate other provisions, such as property division and parenting time. If you miss the December 31, 2018 deadline, you may be able to avoid being taxed while paying spousal support by paying those amounts in advance as part of a one-time property settlement. This is best considered in short-term spousal support cases, such as when a stay-at-home parent needs time to complete training and enter the workforce. In those cases you may be able to pay the "present value" of spousal maintenance in one lump sum at or near the time the divorce is finalized. If you don't have access to sufficient cash assets for a one-time payout, you may also consider awarding the non-wage-earner spouse a larger percentage of your retirement investments in lieu of spousal support. This is most beneficial when the parties are older, because there are tax consequences to withdrawing certain retirement assets early that don't apply once the parties pass retirement age. If you are considering this option and your former spouse will likely need those assets sooner, you may need to shift the settlement number further than you would expect to account for those tax penalties. Divorce negotiations, particularly using a mediated or collaborative model, allow for a great deal of flexibility in coming to a fair and equitable distribution of assets. This means that even if you are unable to finish your divorce in 2018, you may be able to account for the tax changes in your settlement. But the tax law changes will limit your options. If you are considering divorce and think you may end up paying spousal support, contact Kimberly now so you can get the process started and beat the tax law deadline.